2 Scope of workshop considerations. 3 Cost-risk trade-offs in Australia's rural electricity supply networks. 4 Rural power supply options in summary. 4.1 Bare wire overhead power lines. 4.2 Covered or insulated wire overhead power lines. 4.5 Network protection and control options. 5 The affordability of rural power supply. 5.1 What do local electricity networks cost? 5.2 What would it cost to change the network? 5.3 How do customers pay for their local network? 5.4 What might customers have to pay for a safer network? 6 The management of potential risks. 6.1 Fire starts from rural electricity assets. 6.3 Fire risks and mitigation strategies. 6.3.1 Minimisation of occurrences of defective operation. 6.3.2 Minimisation of energy release in incidents. 6.3.3 Reduction of probability of ignition. 6.4 New and developing risk management options. 7 Regulation of rural power supply in Victoria. Appendix A Victoria's rural electricity networks. Australia has 16 electricity distribution networks with 850,000 km of power lines and cables, 80% of which are located in rural areas. Victoria has five electricity distributors, four of which have rural distribution networks. Two Victorian electricity distributors (Powercor and SP AusNet) have very extensive rural networks, totalling 84,000 km of power lines1. This paper focuses on the fire risks associated with rural, rather than urban, electricity networks. Involvement of rural electricity assets in fire starts is a known risk and specific strategies are used to manage it, including line inspection, maintenance and vegetation management. The suspected role of rural power lines in the catastrophic early 2009 Black Saturday fires in Victoria has prompted a new review of options to further reduce this risk. The Victorian Bushfires Royal Commission (VBRC) has heard evidence that the Kilmore East fire, for example, started when a live wire fell from a power line and further, that this fire start then developed into a major fire that caused 119 deaths and catastrophic losses of property. The Victorian Government has announced plans to coordinate a national workshop. The workshop will be a forum for community and consumer representatives, including from bushfire affected communities, electricity businesses and government to consider the benefits, disadvantages and costs of alternative electricity distribution technology in regional areas to reduce the fire risk in a way that is consistent with government policy objectives of safe, reliable, secure, affordable and sustainable energy supply. This paper sets out information to support efficient focused discussion at the workshop to be held in Melbourne on 21 April 2010. The causation chain for property loss, injury and death in bushfires2 is shown in Figure 1 overleaf. To cut risk of catastrophic losses to the minimum level possible, interventions must be efficiently deployed across all links of the causation chain shown in Figure 1 in a way that delivers maximum overall effect. This means opportunities to reduce the incidence of fires from electricity distribution assets must be considered along with opportunities to reduce fire starts from other causes as well as opportunities to inhibit small fires from growing into major fires or to limit consequences of major fires regardless of cause. The workshop is intended to explore and shed light on rural electricity supply options that might reduce risk of fires that cause catastrophic losses. The scope of the workshop considerations is limited to the shaded area shown in Figure 1. Processes associated with the VBRC are addressing other elements of the causation chain and some have already been the subject of recommendations in the VBRC Interim Reports. Electricity is taken for granted as an essential part of life in Australian communities. The primary question is generally not whether to use it - rather, it is how to best supply it to where it is needed. Power lines that deliver remotely generated electricity to the home, office, farm or factory have been historically preferred by most customers and communities over the option of installation and operation of local stand-alone generators. Rural power lines exist for the sole purpose of serving rural communities3 - communities that experience all the benefits, costs and potential risks arising from the power lines that supply them. Table 1 lists some of these. Access to lower cost electricity – supply from the shared network may be less costly than running a local generator. More reliable supply – supply from the shared network may be more reliable than a local generator. This can be critical for pumping water and sewerage, telecommunications, and people on life support equipment. Environmental – supply from remote generators may produce less pollution and use less resource per unit of power than local generators. Part of electricity bills – the cost of each distributor's network is added to other costs4 in the electricity bills of all customers located in that distributor's territory. Loss of visual amenity – overhead power lines may be regarded as visually unattractive, vegetation must be cut back around and under power lines. Environmental – fires, easements and vegetation clearance can affect local biodiversity. Electrical safety – fallen power lines can be a safety hazard, high loads can contact overhead lines. Fire safety – failure of power line components, contact between lines and vegetation, bird/possum flashovers, can all start fires. Consequences can include trauma, injury, death, property loss, plus financial and economic costs. Mechanical safety – falling poles can create safety hazards, roadside poles can be involved in vehicle accidents. Most of Victoria's rural power lines have been built to technical standards designed to minimise cost to the community within historically accepted levels of risk. Following major fire events in 1977 and 1983, changes to power line design and maintenance practices shifted the balance somewhat towards acceptance of higher electricity costs in order to reduce levels of some specific risks5. The involvement of rural power lines in Victoria's recent catastrophic Black Saturday fires prompts us to review this balance once again. Trading off costs against risks challenges our thinking. It requires judgement and the weighing of many factors – quantitative and qualitative, tangible and intangible - together in a single decision making process6. 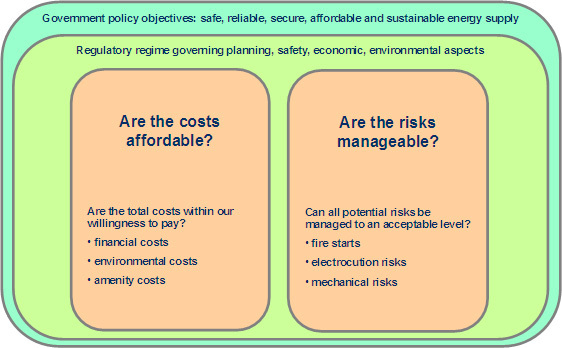 Both costs and risks are complex: costs can be financial, economic or environmental; risks can include frequent events of limited individual impact or very rare but potentially catastrophic ones. They also can encompass a mix of quantifiable outcomes (financial and economic losses) and more serious but less quantifiable outcomes (trauma, injury and death). Nevertheless, we as a community make cost-risk trade-offs in many areas – road safety, health care, air and rail travel, and so on. Electricity supply is no exception to this. Available resources are always limited, so we have to make similar trade-offs in allocating funds between electricity supply, roads, trains, water supply, police, schools, hospitals and other elements of our social infrastructure - with the overall goal of maximising benefits and minimising total risks to people, families, communities, and homes, farms and businesses. Government policy objectives for safe, secure, reliable, affordable and sustainable energy supply also means choices between these competing objectives. Trade-offs are necessary at every level and most of them involve weighing risk against other goals. Risks comprise two elements: likelihood of occurrence and severity of consequences. The personal, financial and economic consequences of a fire started by a rural power line can be determined by factors independent of the electricity network, e.g. current and recent weather (wind speed, air temperature, vegetation moisture content), bushland 'fuel load', local emergency services response capability, and so on. Risk mitigation investment can target either or both likelihood (fire starts at electricity assets) and severity (damage caused by bushfire) which adds another dimension to cost-risk trade-off decisions. The best investment may be in addressing consequences rather than likelihood, depending on the cost-risk trade-off. What is our willingness as a community to pay for further reduction in the level of potential risk? What is the maximum level of potential risk we can accept? Beyond this level, risks might be seen as unmanageable and potentially unacceptable at any cost. This might force a more radical discontinuous shift to different approaches. In the rural electricity supply context, this may mean removal of some overhead power lines and restrictions on construction of any new ones to service new customers. 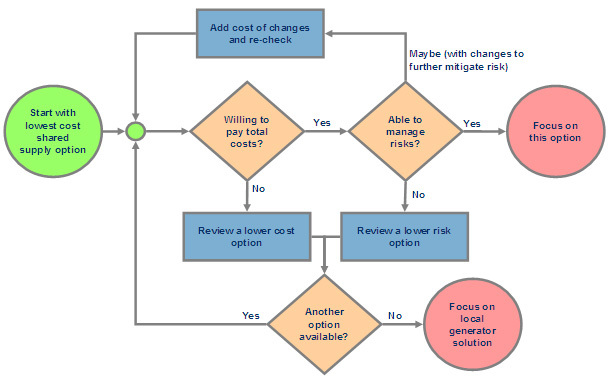 Figure 2 shows a potentially useful framework to think about cost-risk trade-offs in rural power supply. It sets out the two essential considerations that must be addressed by decisions on power supply and indicates the context in which they must be addressed. For efficient thinking, this framework separates the two major questions of affordability and risk management. However in reality, they must be considered at the same time and the results of each factored into the other, especially because total costs include risk mitigation costs. An iterative decision process is required. Further, the manageability of potential risks depends strongly on local factors and very different considerations will apply in peri-urban areas, grassland plains, mountain forests and desert country. In order to consider these complex issues in a way that aids efficient discussion and decision making, trade-off decisions are best broken down into a logical structure of issues and sub-issues, decisions and sub-decisions. 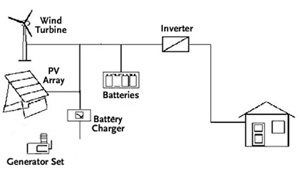 Figure 3 shows a potentially useful logic flow chart for high level exploration of available rural power supply solutions for a typical Victorian community. The logic flow is circular and iterative: starting from the lowest cost option or the status quo, it systematically explores all options to identify the one that is most affordable at an acceptable level of risk. This process can narrow considerations to just one or two preferred options which can then be explored in more detail to confirm their suitability and determine the single best solution. The more detailed investigation can include more sophisticated business case modelling to put a value on risk reduction by estimating the avoided financial and economic cost. In reality, the approach shown in Figure 4 is an aid for rapid convergence to a multi-faceted solution that blends options from each category of action to deliver the overall best result. The emergence of new local electricity generation technology continues to raise further possibilities for a progressive shift towards local generators on the basis of relative cost. These solutions involve different risks again, some of which are related to fire risk. Most electricity consumers continue to opt for local generators only in remote locations or on ideological grounds. 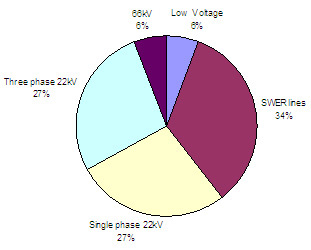 Options in current use (or under development) for rural power supply networks are mapped in Figure 5. Each of these is briefly described in the following sections. This paper focuses on fire risk associated with the 88% of rural networks comprising just three types of overhead lines: three phase and single phase 22kV lines and SWER lines. Some limited data is provided on the remaining 12% made up of 66kV and low voltage lines. 1. Three phase lines (three wires): In Victoria, this type of line is called a 22kV feeder because the voltage between any two of the three wires is 22,000 volts. One of these lines can supply 5-10 (small/medium) towns spread over a distance of many tens of kilometres. There is around 22,700 km of three phase rural 22kV lines in Victoria. 2. 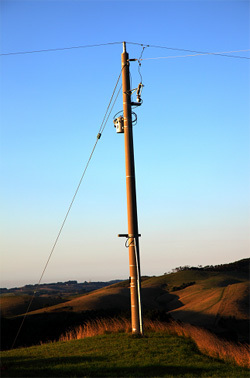 Single phase lines (two wires): This type of line can supply small groups of houses or farms spread over a few tens of kilometres, although many of them are quite short and supply just one property. The voltage between the two wires is 22,000 volts, i.e. the line is formed by extending two of the three wires in a 22kV feeder. There is around 22,800 km of single phase rural power lines in Victoria. 3. SWER9 lines (one wire): Around 28,000 km of SWER power lines exist in Victoria. This type of line typically supplies 10-50 farms or houses spread over distances up to 20 km. The voltage between the wire and the ground below it is 12,700 volts. The most common wire used is three stands of galvanised steel strung at high tension, so spans between poles can be very long – often more than 500m and in special cases more than 1,000m – which greatly reduces costs in hilly country, as illustrated in Figure 10. SWER lines generally run point-to-point, i.e. in a straight line across farmland to the load, which might be a house, a milking shed, or an irrigation pump. Each of these three types of power line uses bare wires supported on poles by means of appropriate insulators and cross arms. The technology involved is relatively simple and well understood. Bare wire overhead power lines have been used as a low cost, safe and reliable solution to rural power supply requirements in Victoria and many other places around the world for nearly a century. It is possible to use plastic-coated wire on overhead power lines. The coating can even be of sufficient thickness to provide complete insulation so the live wire is safe to handle and insulators and cross arms are not required on the poles. It is much heavier than bare wire, so more poles per kilometre are required and its service life is generally shorter - both factors increase costs. It is also much more susceptible to fire damage. ABC: A three phase power line of this type is referred to as Aerial Bundled Conductor which comprises a bundle of fully insulated wires. High voltage ABC is suspended from a steel cable stretched between poles. ABC has been used in Victoria for at least the last two decades for low voltage (415 volt) reticulation in urban areas when special circumstances apply as well as more widely in heavily forested areas. At low voltage levels, ABC technology is fully mature. Only a small amount of high voltage (22,000 volt) ABC has been used, mainly in forest areas such as the Dandenong Ranges to avoid removal of major trees. However, more development is required before high voltage ABC can be regarded as a fully mature technology. There is also a question of whether, when this development is complete, high voltage ABC will have any significant cost advantage over underground high voltage cable. IUC: Insulated unscreened high voltage conductor is not widely used in Victoria10, though it has a significant presence in some other jurisdictions, such as South Australia. It reduces ignition risk and vegetation clearing requirements. Under Victorian regulatory standards, IUC must still have no vegetation overhanging it. All varieties of insulated overhead power line can be more challenging to maintain because the insulation coating can hide conductor damage from inspection. Also, despite its limited presence and the relative youth of the asset base, failure of an ABC line has already caused at least one fire in Victoria. It is possible that when bundled conductors do fail, they may release much more energy into the environment than when a tree contacts a bare wire line. Three phase underground 22kV line technology is used extensively in Victoria's urban areas and is a mature well understood technology. Its high cost has generally ruled out significant use in rural areas. Underground power cables must be buried to a minimum depth of 600mm and trenching is a substantial portion of the total cost, particularly in rocky areas. Plough installation of underground power lines has been mentioned in the VBRC as an option to reduce the cost of installation. This technique has been used at least once for installation of an underground cable under a forest road in Victoria to avoid the necessity of major tree clearing rather than for cost reasons. It is not applicable in areas containing rock. Victoria has a small number of instances of relatively short (less than two kilometres) underground SWER and single phase lines installed for customers or developers of rural estates seeking for example, to reduce tree clearing and enhance aesthetic value. A RAPS system to provide all of the power requirements for an energy-efficient house with a typical range of appliances can cost up to $50,00011, although the cost of a small system to run a farm shed light using one solar panel and a small battery can be as low as $200. A recent study12 has estimated the average cost of RAPS at $16,700 per kilowatt. The size of the system needed will depend on the number of people in the home, what appliances are in use, and how often they are used. Government rebates can be available to pay for a portion of the installation cost if renewable sources are involved. There is little firm data on the operation and maintenance cost of RAPS facilities. Fuel and regular battery replacement are likely to be significant items. RAPS systems require a degree of technical skill and discipline to manage safely. They involve local storage of flammable materials and acid and use electrical equipment that operates at potentially lethal voltages, both alternating current (AC) and direct current (DC)13. In addition to the more visible features like power lines, electricity distribution networks rely on a plethora of different protection and control systems and devices for safe reliable operation. It is beyond the scope of this paper to cover this diversity in detail. The following summary offers basic coverage of key aspects, adequate for high level workshop discussion of the comparative strengths and weaknesses of different network technologies. For single phase and three phase lines, special devices called 'sensitive earth fault relays' detect what has happened (even if the current into the earth is only five or ten amps) and quickly (a few seconds) switch off the power to the line. This is true of Australian and European networks where customer load current flows down one wire and back another – hence, small 'leakage' currents to earth are detectable. Some US networks operate differently and the customer load current flows back along what is called the 'neutral' wire, so sensitive earth fault detection is not possible. Detection of faults on such systems relies on less sensitive 'over-current protection'. In the case of SWER, current flows through the earth in normal operation, so a small additional current due to tree contact sometimes cannot be distinguished from the current caused by a small amount of additional customer load. For this reason, traditional sensitive earth fault protection cannot work on SWER systems and detection of faults relies on less sensitive 'over-current protection', i.e. faults on SWER systems can only be detected by an increase of line current above pre-defined design levels. This means that faults that involve low current such as a dry tree branch contacting a live wire, may not be immediately detected and the line remains energised. Either the fault will self-clear (e.g. by the tree branch burning through and falling clear of the line) or the current will increase as the fault develops until a fuse or other over-current protection operates to disconnect the power. Oil Circuit Recloser (OCR): older models that operate hydraulically and are not remotely controllable. These are usually located at the point a SWER system is fed from a three phase 22kV line. Auto Circuit Recloser (ACR): modern electronically operated models that can be fitted with remote radio control. These tend to be used on three phase 22kV feeders. 3. Fuses: The simplest form of over-current protection is the fuse and high voltage fuses are still used extensively on distribution networks as the first line of fault isolation. Many fuses are mounted close to equipment they protect. For example, if a pole-mounted distribution transformer develops an internal short circuit, fuses on the supply side of the transformer blow to prevent a transformer explosion. The customer supplied by that transformer may remain off supply until it is replaced in a few hours. Other customers are unaffected. Malfunction of a fuse can release hot material and lead to a fire start. 4. Auto Reclose: Most faults are transitory, e.g. lightning strikes, flying tree debris. Few are sustained, e.g. fallen lines. Protection and control systems on the high voltage network re-apply the power after a few seconds in case the fault has gone away. This is termed auto reclose and is a major factor in enhancing supply reliability in rural areas. Electricity networks are monopoly businesses regulated by the AER. Every five years they submit a proposal to the AER seeking approval for total revenue and network service prices required to raise that revenue based on estimated annual electricity consumption. The revenue collected is intended to cover reasonable business costs and provide returns sufficient to attract necessary investment. Key dimensions of Victoria's rural distribution networks are estimated14 in Table 3. In summary, Victorian electricity customers pay via their electricity bills about $1 billion annually to use networks worth more than $4 billion15. The annual cost of network operation, customer service, revenue collection, asset inspection, testing, repair/refurbishment, and vegetation management. The annual cost of necessary capital works. 'Regulated asset base' (RAB): approximates depreciated replacement value. Many aspects of Victoria's network businesses, including management of safety risks to the public and employees, are regulated by other bodies. For example, EnergySafe Victoria covers electrical safety and vegetation management to maintain line clearances. Network owner submissions to the AER (and hence, the data shown in Table 3) include embedded risk management costs of meeting standards imposed by these other regulators. The scope of this workshop includes consideration of different network technologies that offer potential to reduce fire risks. The cost of these varies widely, as indicated in Table 4. Estimated costs quoted in VBRC submissions also vary widely due to variations in the detail of the assumptions used in their derivation. The reality is that the cost of most options under discussion is highly dependent on a number of variable factors, including: Is the route 'green fields' or 'brown fields16'? Is the terrain flat or hilly? Does the ground contain rock? Is the route treed or clear? How many customer substations are required per kilometre? These vary from location to location across the State and any attempt to estimate total state-wide costs demands that assumptions about average conditions be made. The indicative cost rates per route kilometre shown in Table 4 were selected as close to the mid-range of data from a number of industry sources for typical conditions in rural Victoria17. 1. Route length increases: A change from point-to-point SWER to any other technology requires a route length increase of 30-70%. Undergrounding of a three phase overhead line generally requires an increase of 10-30%. 2. Regulatory approvals: The different technologies require different degrees of negotiation and approval by various parties in order to meet all regulatory and planning requirements listed in Table 5. These add 3-10% to costs depending on technology. Customers would bear additional costs (not included in the above estimates) to install underground service cables from new points of supply to load locations on their property. SWER lines run to load locations; other options provide supply at the property boundary. This cost has not been estimated, but can be expected to be of the order of $60-70/metre plus termination costs which can increase costs for short runs. Each electricity network business submits a proposal to the AER that seeks approval for total revenue and a set of network service prices required to raise that revenue based on estimated annual electricity consumption. Once approved by the AER, the network service price schedule applies to all customers in that network owner's licensed territory and it does not vary by location20. The price is usually in the form of a standing monthly charge plus a series of prices expressed as cents per kilowatt hour of energy used. The prices are used by electricity retailers to calculate a network service charge which is then added into each electricity account served to customers connected to the network. In Victoria, this network service charge averages slightly less than half of customers' total electricity bills. The remainder is for electricity purchased and other costs listed in Footnote 4. The changeover to a new undergrounded network would be progressive. Submissions to the VBRC indicate it could not realistically be completed until 2050, although the SWER network might be able to be completed in the first decade. The results for the various options are shown in Figure 13. 2011 to 2020: In the first decade the only work performed and hence added cost is SWER replacement. Since IUC is the lowest cost option and ABC is the highest cost option, at the end of the ten year SWER transition annual charges have increased above baseline by $150 (for IUC) to $530 (for high voltage ABC). The 'current arrangements' baseline also rises in this period as ageing assets are replaced, before reaching a plateau and declining again over the next few decades. Beyond 2020: The picture is more complex because the lower service life of new technologies comes into play. None of the new technologies has the long (50+ years) life of current technologies. After 20 years, ABC must be replaced. After 30 years, IUC must be replaced22. The result is a second wave of price increases. By 2040, annual charges have risen above baseline by $250 (for SWER moved to IUC plus 22kV lines moved to ABC) to $800 (for both moved to ABC). Beyond 2040: The last decade of the modelled period shows the additional cost of undergrounding 66kV and low voltage lines which constitute the final 12% of all rural overhead lines. By 2050, average annual charges are between $500 and $800 above baseline, except for the case where 66kV lines remain as overhead bare wire lines. These increases do not include widely expected rises in the cost of electricity caused by a carbon price, expansion of the renewable energy target scheme, global gas price rises and the short term impact of introduction of smart meters. Considerable (±30-40%) uncertainties remain in the input cost data, especially for IUC and high voltage ABC, and there are significant simplifying assumptions made to make this long term modelling possible. Many customers in sparsely populated areas of the state run agricultural businesses and are connected as two customers (a residence and a business) so they may pay up to twice the amounts shown. Submissions to the VBRC suggest that 50% of the cost of undergrounding should be borne by other sources - this (yet to be confirmed) offset is not reflected in the modelling results. The work is assumed to proceed as follows: 2011-2020 underground/ABC all SWER; 2021-2040 underground/ABC all 22kV; 2041-2050 underground all 66kV. Only lines will be done, pole mounted equipment and tee-offs will remain. A 15% 'high volume process' cost saving has been assumed available from standardisation and specialisation. No allowance is included for short term interim measures to reduce fire risk; these would be additional cost. 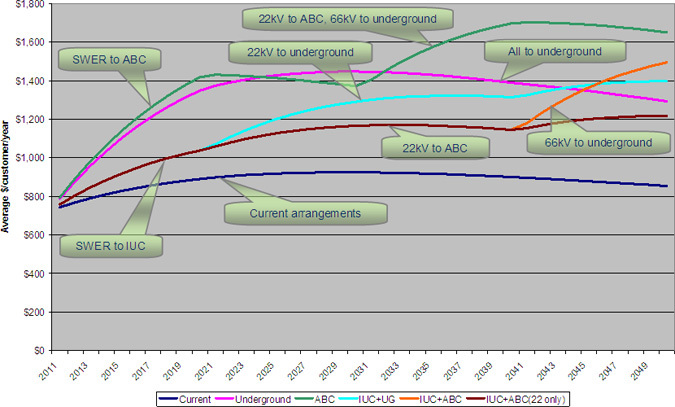 HV cable service life averages 40 yrs; ABC 20 years; IUC 30 years; there is no reduction in overall maintenance costs though the activities mix changes. Underground cable replacement will start in 2050, increasing prices further. The model is simplified and does not reflect, tax, performance incentives, efficiency benefit sharing and indexation. WACC (real pre-tax) and existing asset depreciation have been estimated to match current 5 year average outcomes. All other factors are assumed constant, e.g. no changes in network costs caused by climate change adaptation, smart grid implementation, etc. The 'current arrangements' case includes capex for replacement of old assets. The model does not include the potential effects of resource constraints (skills), regulatory delays and the complexity of running two different systems during the work program. A key issue may be the effect of cross-subsidisation on overall economic efficiency of the rural economy. The reality shown by the modelling is that up to 30% of the total increase in the average network charge is for a safer SWER network which supplies only 4% of total network customers in the area modelled. Underground high voltage cable: Installation of underground cables disturbs the environment more than installation of overhead lines23, though once installed the only visible reminder of their presence is the warning signs erected along their length to alert those who may need to dig in the vicinity. Reinstallation would be required every 30-40 years or so. The generally reduced requirement for tree clearing with an undergrounded network can lead to a 'greener' landscape appearance, although many poles supporting various items of equipment will remain. 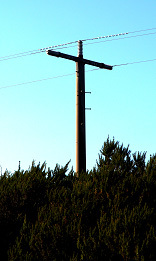 The undergrounding proposal reviewed here does not include removal of poles supporting transformers, switches, reclosers and other network equipment or tee-off joins; on many 22kV feeders these are frequent along the length of the line and it is possible the removal of the line itself may make these appear more prominent than before. To underground these items or move them to ground level steel cabinets would increase costs by a factor of two to three times. In particular, a pole will generally be required near each property's point of supply to hold the distribution substation (transformer) supplying it. The term 'undergrounding' may generate community anticipation of complete removal of all visible network assets; public education may be important in setting realistic expectations. ABC cable and IUC: The shorter span length and heavier 'thick black24 cable' appearance of ABC has been known to lead to comments about a perceived 'picket fence' appearance of ABC power lines. IUC is not in widespread use in Victoria but compared to current practice, its shorter span length, thicker conductor and black appearance will make it a more visually prominent technology. The visual impact of this option on Victoria's rural outlooks and landscapes may be significant. To assess the manageability of fire risks associated with electricity supply, it is necessary to understand the rate of incidence of the fires, their causes, and available strategies to address those causes. Over the last five years, electricity assets have been associated with ground level fires in Victoria at an average rate of around one fire every two and a half days. The CFA have received reports of around 40 fires per day on average over the same period, i.e. the number of fires from electricity assets equals26 about 1% of CFA reported fires from all causes. Total fire ban days: incidence of fires from Victoria's electricity assets rises to a little over two fires per day with drier vegetation, hot windy conditions and mechanical stress on electricity network assets from wind loading on wires. CFA statistics indicate fires from other causes also increase by a similar ratio - typically to around 280 fires per day on total fire ban days - so the 1% ratio of electricity asset fires to total CFA fires does not change significantly. If anything, it falls to around 0.8%. 7 February 2009 (Black Saturday): The VBRC Interim Report Chapter 1 states: The CFA indicated there were a total of 1386 incidents reported on 7 February - 592 grass and bushfires, 263 structure fires and 156 reported incidents that were false alarms. The CFA identified 47 fires that had the potential to become 'very severe fires'. Of the fires that were not readily contained on or before 7 February, 14 of those 47 became 'major fires.' Evidence has been heard in the VBRC that perhaps 10-20 of the 592 grass and bushfires may have started from problems with electricity assets, although the cause in all cases cannot be established with certainty. If true, this might indicate the involvement of electricity assets in total fire starts increases on days of extreme fire risk to around 1.7-3.4%. 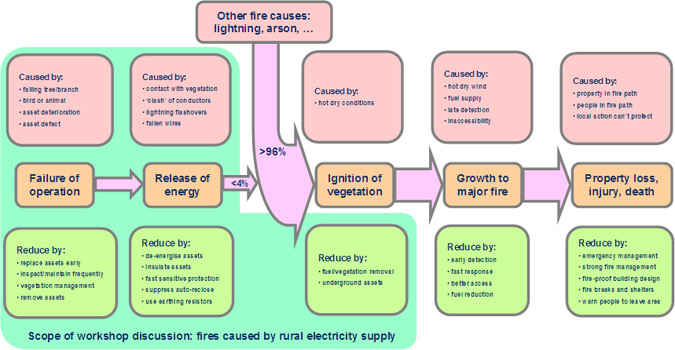 The diversity of causes of fires from rural electricity assets is indicated in Figure 14. The biggest change in the cause-profile on total fire ban days is the marked increase in fires associated with trees27. 5. Pomborneit-Weerite: evidence on the cause of this fire remains conflicting and disputed. Submissions to the VBRC that are particularly relevant to this workshop have covered: an apparent over-representation of fires from electricity assets in the small number of fires that caused catastrophic losses29; progressive reduction by 75% between 1976 and 1996 in the number of fires started by Victoria's public utilities each year; electricity network operation and maintenance practices that may reduce risk of fire starts from electricity assets (especially during days of heightened fire risk); particular features of ageing SWER assets that may have potential to exacerbate fire risk; undergrounding/insulating of rural power lines to deliver a step change reduction in fire risk; and, the adequacy of the regulatory regime covering electricity distribution businesses in addressing fire risk from the presence of their networks in rural areas. 5. Action to strengthen relevant regulatory capability and enforcement. Stakeholder submissions in response to these recommendations have outlined estimates of cost, logistical challenges and adverse impact on rural supply reliability. 3. Reduce the likelihood of ignition when energy release occurs. For maximum effect, deployment of available resources between these three strategies should be guided by the comparative fire start statistics shown in Figure 14. Many of today's practices already reflect these three strategies. This is the fundamental goal of most electricity network design development and operations and maintenance practices. To achieve this goal, electricity assets are considered together with the environment in which they operate, especially surrounding vegetation. Recognised industry best practice in prevention of failures in complex technical systems is reliability centred maintenance (RCM30) planning supported by regular condition monitoring with results fed back into design development. For electricity networks, condition monitoring generally comprises regular visual inspection supplemented by testing whenever inspection cannot reveal all incipient defects, e.g. testing wood poles for internal rot. Inspection of electricity assets covers their environment, e.g. surrounding vegetation and third party encroachments, and is usually augmented by specialised technologies such as stabilised binoculars, infrared thermal imagers, overhead down-facing cameras, etc. 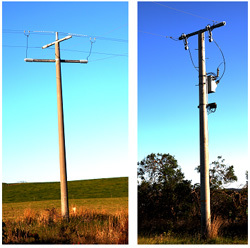 In Victoria, all electricity network assets are subject to visual inspection and all wood poles are tested for rot at least every five years. Statutory vegetation clearances around all assets in fire risk areas are checked and confirmed annually before each fire season. Various other intervals are defined using RCM principles to plan the testing of protection and control systems, SWER earths, and other assets for which visual inspection alone will not reveal potential defects. Individual defects are scheduled for action when detected and the action can be life-extension (e.g. pole staking) or replacement. If frequency of a particular defect increases to justify it, batch replacement of an asset class can be used to remove a specific risk. Realistically, no strategy can completely eliminate all occurrences of defects in a complex system like a rural electricity network, but the risk of such occurrences can always be further reduced for an additional cost. The approach used in Victoria manages the occurrence of defects to achieve a particular standard of network performance that is effectively defined by the industry's multi-faceted regulatory regime described in Section 7 below. 1. Incorrect current flow: current flow through the local environment, i.e. not safely through customer appliances or loads as intended. The most common case is a tree that falls on a live overhead wire. Another is a broken or loose wire that contacts a tree or falls to the ground. In each case, the current flow from the wire to the tree or the ground causes heat and sparking which can ignite vegetation. Sometimes a tree branch can fall and lie across a set of live wires and the current flow is between the wires through the branch, causing it to eventually burn through and fall to the ground potentially still alight. An unfortunate bird or animal can suffer the same fate and cause a fire when they fall. 2. Release of hot material: defective equipment operation that causes hot material to fall to the ground - the energy in the hot material may be sufficient to ignite vegetation below. Potential sources of hot material include conductor clashing, fuse malfunction, and surge diverter or transformer explosion. 3. Lightning: a lightning strike which causes a flashover between the live wire and a pole or cross-arm. Strategies that are theoretically available to limit the amount of energy released into the local environment when something goes wrong are listed in Table 10. Because SWER uses current through the ground as a natural part of its operation, strategies available to limit energy release from defective operations on SWER systems are more constrained. 1. Is there a 'safe' level of energy release, i.e. which will never cause ignition? 2. Is there an 'unsafe' level of energy release, i.e. which will always cause ignition? The potential value of strategies to limit energy release remains unclear so long as these questions cannot be answered. Unless a strategy reduces energy release below 'safe' levels it can only deliver partial benefits, though these may still be valuable. If it cannot reduce energy release below 'unsafe' levels, then it may have little or no value at all. At present there are no industry standards for the level of energy release31 that may be accepted without risk of ignition32. If the only acceptable level of energy release is none at all, then apart from de-energisation (completely cutting off supply) during periods of elevated risk, most strategies listed in Table 10 will deliver partial benefits at best and none at worst. If the minimum energy release after application of a particular strategy is always more than the 'unsafe' level, then the strategy is of little or no value. For example, with strategies to suppress auto-reclose, if the energy released in the initial fault is always sufficient to cause ignition in extreme fire risk periods, elimination of any subsequent energy release by suppressing reclose makes little or no difference to the final result. Additional failure modes: if a strategy introduces new failure modes into the overall system, it can increase overall fire risk rather than reducing it. For example, additional surge diverters to safely divert lightning energy to ground and avoid flashovers can also increase risk from surge diverter explosions. Loss of supply: if the strategy adversely affects supply availability during emergencies, it may thereby hamper good fire management through loss of access to pumped water and petrol stations, progressive loss of mobile phone towers33 and telephone exchanges, loss of local hospital facilities, etc. Loss of air conditioning can increase risk of death of particularly vulnerable people from heat stress. These may be important factors in assessment of de-energisation and auto-reclose suppression strategies34. In summary, assessment of the relative value of strategies to limit energy release when operational failures of electricity assets occur remains problematic. A positive development is that modern remote control technology offers the potential to enable them to be turned on or off by region according to local fire risk levels on the day. Given occurrences of defective operation and consequential release of energy into the local environment, the next available means of reducing fire risk is to reduce the probability that the energy release will cause ignition. This can be done by other means than reducing the amount of energy released. The most direct way is to separate the released energy from vegetation and other combustible materials and the most obvious way to do this is to put the assets underground. Whilst underground cables still fail - less frequently than overhead lines but usually with greater energy release – the released energy is dissipated harmlessly in earth and soil and fire starts from this cause are almost unknown. Full undergrounding of all electricity assets is extremely costly and has not been modelled in Section 5.4 above. The undergrounding of power lines only (leaving pole mounted equipment and tee-offs in place) will greatly reduce or even eliminate fires from the two biggest causes in Figure 14 above (trees and conductor failures). A number of other risks would be reduced or remain relatively unaltered. Another option that has been canvassed to reduce ignition probability is to clear vegetation from an area around poles prior to each fire season as many potential fires start close to poles rather than along the line. VBRC evidence and submissions were not in agreement on how far molten metal particles may travel in the case of conductor to conductor contact, so further investigation may be needed before this option can be confidently assessed. Enhanced ability to detect and interrupt low current faults. Enhanced ability to dynamically adjust performance characteristics to match fire risk. Both of these goals may be addressed by new technology that combines the functionality of modern automatic circuit reclosers with new digital protection systems and radio based remote control capability. Some stakeholders are already assessing this opportunity and there would appear to be good prospects for advances in this area. 2. New local energy production or storage options: The Victorian government and rural communities remain committed to preserving reliability of supply. This makes strategy options such as de-energisation or temporary suppression/limitation of auto-reclose unattractive. Options for communities or individual facilities to ride through supply interruptions may allow the potential value of these strategies to be realised. Portable generators are a well understood commodity often used to prevent planned network outages from affecting critical loads. A new option yet to be fully assessed is modern battery/inverter combinations charged from the mains supply in a manner analogous to the Uninterruptible Power Supply (UPS) systems used for computers. The workshop discussion will cover these options in addition to those covered more fully in this paper. Prescriptive regulation, where the responsibility of the enterprise is solely to comply with the prescribed standards. An example of prescriptive regulation is the line clearance regulations for vegetation management. A recent review35 by the Victorian Competition and Efficiency Commission (VCEC) confirms that prescriptive regulation removes incentives for improvement and is unsuited to simultaneous management of multiple diverse risks. 3. Electrical safety management schemes36. In submissions to the VBRC, the Government of Victoria has stated its intention to legislate to clarify and strengthen a number of features of the regulatory arrangements covering fire risks from electricity networks and to introduce an incentive scheme to encourage network owner action to reduce the number of fires started by their assets. National harmonisation of electrical safety regulation is getting underway. In December 2009, the Ministerial Council on Energy (MCE) Energy Technical and Safety Leaders Group released a Harmonisation Enhancement Plan which proposes a formal inter-governmental agreement on key elements including a proposed standard Energy Network Safety Scheme and a national governance body, the Energy Supply Industry Safety Committee. The plan proposes retention of existing state-based regulators operating in a highly harmonised way in accordance with the inter-governmental agreement. Implementation of the plan is proposed to be completed by the end of 2012. A national economic regulatory regime governs recovery of the cost of investing in network assets. This regime, which was established by agreement of the Council of Australian Governments (COAG) on advice from the Ministerial Council on Energy (MCE), is set out in the National Electricity Rules (NER) made under the National Electricity Law (NEL). The economic regulator of Victorian electricity distribution businesses is the Australian Energy Regulator (AER). The NER, together with guidelines promulgated by the AER under the NER, spell out the detailed processes and principles to be applied by the AER. The process for determination of network owner revenue is set out in Chapter 6 of the NER37. This includes provision for various performance incentive schemes that encourage network owners to maintain and improve performance, for example, supply reliability. The AER evaluates the revenue proposals of distribution businesses against the requirements of Chapter 6 of the NER and the national electricity objective set out in the NEL, viz. 'to promote investment in, and efficient operation and use of, electricity services for the long term interests of electricity consumers'. This can include assessment of the efficient cost of compliance with statutory obligations such as the line clearance regulations administered by ESV. In December 2009, EnergySafe Victoria and the AER signed a formal memorandum of understanding38, recognising the importance of consultation between them when their responsibilities overlap. 1 Jemena and United Energy have some rural network but are mainly urban. 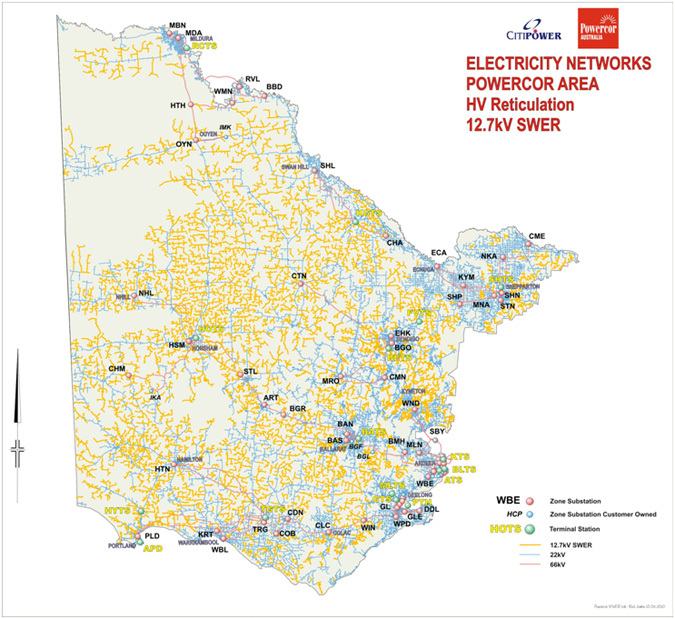 Citipower does not have a rural network. 2 In Victoria, electricity assets are associated with <4% of total fires (see Section 6.1 below). Given the low numbers of fires involved and the extent of Victoria's regional electricity distribution network (see 0), involvement of electrical asset fire starts in catastrophic fires on any particular day can be a purely random outcome. 3 The only exceptions are major transmission lines that pass through rural areas. Such lines were not involved in starting recent catastrophic fires. 4 Distribution network cost is only one component of retail electricity bills – others include transmission network costs, market/grid operation fees, retailer administration (billing and call centres) costs and wholesale energy purchases. 5 Especially the risk of fires caused by conductor clashing, vegetation contact and mechanical failure. 6 The underlying principles and frameworks of sound risk management are set out in Australian Standard AS/NZS ISO 31000:2009. 7 Both de-energisation and suppression of auto-reclose may be counter-productive (see Section 6.3.2 below). Use of portable generators or other options (local battery storage) to preserve supply reliability may make this option viable. 8 This table introduces a number of acronyms used in later sections: RCM: Reliability Centred Maintenance – a best practice framework for planning maintenance activity; ACR: Auto Circuit Recloser, a type of automated high voltage switch; SWER: Single Wire Earth Return – a type of bare wire power line, see Section 4.1 below; IUC: Insulated Unscreened Conductor – a type of power line using separate insulated conductors, see Section 4.2 below; ABC: Aerial Bundled Conductor – a type of power line using a single bundle of insulated conductors, see Section 4.2 below; RAPS: Remote Area Power Supply – local power generation not connected to the network. 9 SWER (Single Wire Earth Return) is fundamentally different from the other lines because the current flows along the single wire and returns to the source through the ground – in three phase and single phase lines the current flows out along one wirer and returns via another. Since the 1920s, more than 200,000 kilometres of SWER have been installed for rural electrification in Australia and New Zealand. It is used in Canada and the United States, as well as developing countries including Brazil, Laos and South Africa. It is considered safe, reliable and low cost provided it is installed in accordance with appropriate standards such as AS2558 for SWER transformers, and is properly maintained to standards such as Victoria's statutory line clearance regulations. 10 A very small amount of 11,000 volt IUC has been used in urban areas to reduce outages from interactions with street trees. 11 See www.environment.gov.au/settlements/renewable/power/raps.html for more details. 12 PB Power Indicative costs for replacing SWER lines report for DPI August 2009. 13 Direct current at lethal voltage levels can present different risks to AC – risks that are not necessarily familiar to most of the community. 14 Costs for rural areas are not separately identified in published data, nor can they be easily derived from it. The best available indicative estimate (that shown in Table 3) is combined 2011 data (in 2009 dollars) from SP AusNet and Powercor submissions to AER for 2011-2015 revenue. This data includes costs for urban areas in major provincial cities, e.g. Geelong, Dandenong, Ballarat, Bendigo, etc. Offsetting this, it does not include costs for the rural areas serviced by United Energy (e.g. Mornington Peninsula) and Jemena (grasslands on the Western fringe of Melbourne). 15 This is RAB which is approximately equal to depreciated replacement value of all assets, i.e. it is not market worth or current replacement value, which may be of the order of twice this figure. 16 'Brown fields' conditions oblige the network owner to keep the old network fully operational until cut-over to the new. 17 Some VBRC submissions contain estimates of cost and average customer charges that differ from those presented in this report. Cost rates quoted in submissions are lower than those shown in Table 4 as they were drawn from a preliminary study on SWER replacement options, assuming flat, clear, non-rocky terrain and 'green fields' conditions (see footnote 12) with no allowance for route extension, regulatory costs and volume efficiency gains. Some data in VBRC submissions is incremental to the status quo, while other statements refer to total cost. When these differences are taken into account, residual inconsistencies are small and well within estimate uncertainty levels. 18 Data drawn from a number of published and confidential sources. Uncertainty levels exceed ±30-40%, especially for IUC and high voltage ABC which are not widely used in Victoria. The scale of any widespread change would be such that efficiencies would be available from standardisation of materials and approaches and deployment of specialist teams, so the rates shown incorporate a nominal 'volume efficiency' saving of 15%. Undergrounding costs are for lines only, i.e. they do not include relocation to ground level or below of pole mounted equipment and tee-offs - this would more than double costs. 19 Only the cost of the initial change is estimated. Shorter service life of new technologies compared to current networks, would require subsequent waves of replacement investment. These are included in the long term modelling reported in Section 5.4. 20 There are some rare exceptions where location specific pricing applies, e.g. alpine areas. 21 Preliminary modelling of the impact on customer charges reported to the VBRC covered SWER replacement only, used a longer 20 year implementation period and a lower cost of capital and was done separately for two individual distribution territories. When these differences are taken into account, residual inconsistencies between those results and the data presented here are well within estimate uncertainty levels. 22 After 40 years, underground cable must be replaced, but as this is beyond 2050 it is not shown in Figure 13. 23 Installation of an underground high voltage cable requires the easement to be temporarily cleared to a width of 10 metres to allow construction vehicle access. 24 Black provides longer service life by inhibiting UV penetration of the plastic covering. 25 Source: Nous analysis of five year data provided by SP AusNet and Powercor and regression analysis of published CFA data on fires and TFB days. 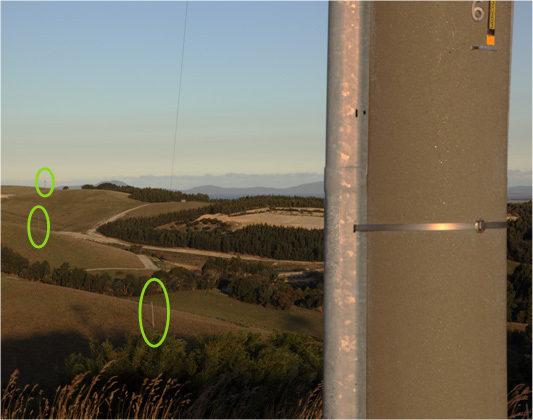 Only electricity asset fires that reach ground level are addressed in this analysis (some fires occur on pole tops and are extinguished there). Fires started on crown land are managed by the Department of Sustainability and Environment (DSE) and are not included in this analysis. DSE fires often start in forest areas and are rarely caused by electrical assets. The DSE Annual Report 2008/09 records that Victoria has on average 652 bushfires per annual fire season with 825 in 2008/09. However, published annual data on DSE fires is not in a form that allows it to be easily integrated with published CFA data. 26 Fires started at electricity assets are recorded as part of normal network operation to preserve or restore electricity supply to customers. Most are not reported to the CFA by the public, nor do they usually spread sufficiently to warrant CFA attendance. 27 Pole fires are less frequent on total fire ban days as these can require light drizzle to occur. It is possible the reduction in bird/animal fires on total fire ban days is due to reduced activity and discouragement by very hot pole top metal fittings. 28 The Commission has chosen to examine 12 fires where lives were lost or significant damage occurred. These are Kilmore East; Murrindindi; Churchill; Delburn; Bunyip; Narre Warren; Beechworth-Mudgegonga; Bendigo; Redesdale; Coleraine; Horsham; and Pomborneit–Weerite. 29 This workshop will not directly address this issue which is likely to lie further along the causation chain in Figure 1. The question of why some fires become major fires while others do not should at least theoretically be less likely to be determined by features of the cause (e.g. the local electricity distribution network, arson) than by a range of factors in fire detection, fire response and fire management arrangements. These matters are being considered in the VBRC process. 30 See US standard SAE JA 1011/1012 or John Moubray Reliability Centered Maintenance (1992) for more details. 31 There are Australian Standards for the fire performance of high voltage fuses and surge diverters that are relevant but directly applicable to those specific classes of device only. 32 Evidence to the VBRC by Dr David Sweeting indicates the relationship between energy release and ignition may be complex - energy must be applied over time to dry out vegetation before it will ignite. Hence, it may not be solely the amount of energy but also the period over which it is delivered into the environment that determines the probability of ignition. 33 Extended supply interruptions in early 2007 revealed that many mobile phone towers shut down after one or two hours off supply. 34 Some of these risks may be mitigated by temporary deployment of portable generators or local energy storage systems. 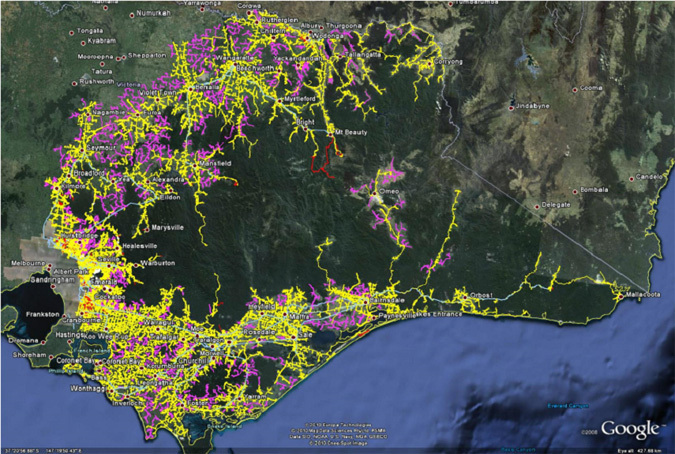 For a detailed outline of factors in decisions on temporary de-energisation and suppression of auto-reclose, see http://www.resourcesandenergy.nsw.gov.au/energy-supply-industry/pipelines-electricity-gas-networks/electricity-networks/safety/electricity_network_safety_issc33_network_configuration_during_high_bushfire_risk.pdf. The working group that composed this guide in 2008 concluded that disabling auto-reclose involved more risk than was thereby mitigated, and hence a mandated standard of auto-reclose suppression could not be supported. 35 (www.vcec.vic.gov.au) The Victorian Regulatory System 2009 (May 2009). 36 The mandated requirement to submit an ESMS was introduced from 13 December 2009. Updated regulations applicable to line clearance will apply from mid 2010. These are expected to increase vegetation clearances around power lines and provide for removal of 'hazard trees' outside the clearance space that pose a potential risk. 37 The NER are available at www.aemc.gov.au. Submissions on revenue and pricing can be found at www.aer.gov.au.